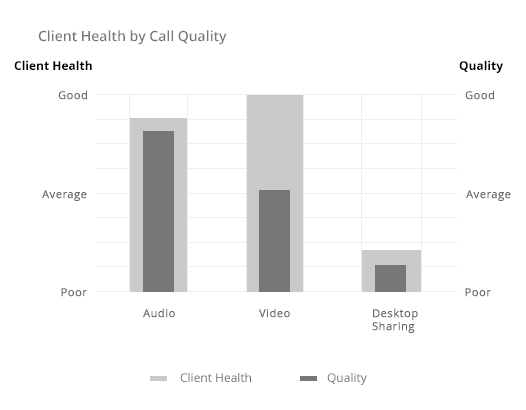 Question to UX/Data/Subject Matter Experts: I'm working on a Call Analysis app where one of the chart is to present the aggregate value of "Call Quality by Client Health by Call Type". If you look in this chart below, in the x-axis I have Call Type, and in y-axis I have Client health on the left side and Client Quality on the right side. 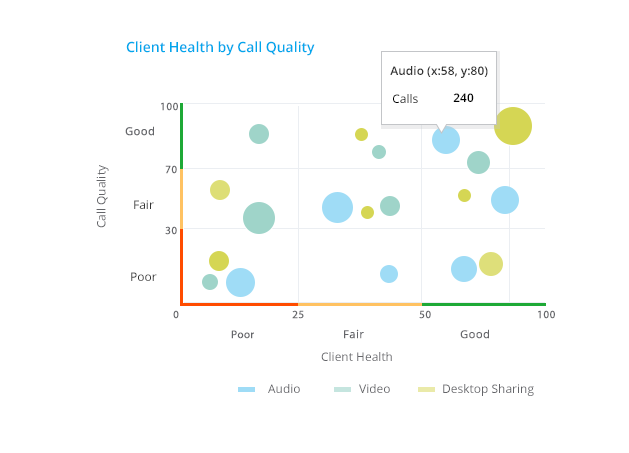 If you look at the Audio vertical bars and Client Health ... What we are planning to show on this chart are aggregate numbers ... How do we do that in the current instance where Audio is a vertical bar and Client Health on the left side Y-Axis (leaving aside Call Quality for now) is divided into Good, Average and Poor? How can we say that there are 40 Audio calls with good CH, 30 with Average CH and 40 with Poor CH? Likewise for Call Quality also? Is there any better way of representing this data? Put Client Health and Quality on the x and y axes. Each Call Type is represented by a bubble in the resulting coordinate system, i.e. a circle whose radius is relative to the total amount of such calls. You can add some labels or colors to indicate the “good” and “poor” areas of the sector. Instead of actual circles you could also scale icons like 🎙, 🎥 and 🖥. Have you considered splitting the information into several charts? The current chart looks sophisticated, which may show that you are clever and have great data analyzing skills. However, it may be hard to read by your intended audiences. The whole purpose for us to do the data analysis is for other people to understand the data, not to show that we can produce beautiful charts ;) So based on my experience, we should avoid having more than two key points in one chart. The problem with your representation of the call analysis data is you have too many information going on in one chart. Thus I suggested splitting your analysis results into chunks. For example, you could use a pie chart to show the percentage of each call type, and then three other pie charts to show the percentage of client health with each call type separately. The same logic goes with the call quality. If the three factors indeed cannot be separated in your case, then maybe consider a three-dimensional chart with an x-axis, a y-axis, and a z-axis (represented by color density). But it would be not intuitively readable by people who is not familiar with the raw data and the analysis. So I wouldn't recommend using that. After all, we are designing the chart to let others read, and grasp our ideas, usually in just seconds. If you still would like to go along that path, I am happy to talk to you about potential solutions. There are a few fancy solutions here but, based on the data you presented, I think the best option is probably a Dual-Y Column Chart. Since the graduations for both Client Health and Call Quality are effectively the same ('Good', 'Fair', 'Poor', 'Unknown') you can easily represent both of these values on the Y axis without causing confusion with scales. Simply representing the two different values with different coloured (and textured if possible) columns for each Call Type should be extremely easy to read. 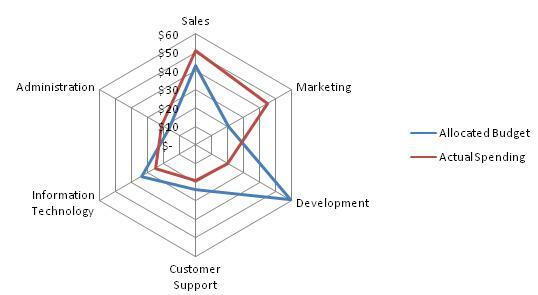 What are you looking for is Radar chart. 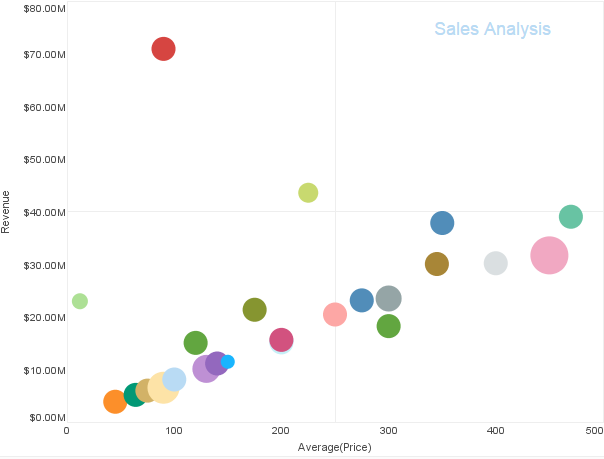 A good rule of thumb to start out with is one or two extra dimensions, such as a color division on a bar chart, or a bubble chart with dimensions plotted by size and color (see an example here from www.inetsoft.com). Go beyond and you are entering the danger zone. So if you’re considering adding more than two extra dimensions to a chart, ask yourself, are you actually hoping to find patterns in the data across that many dimensions? Or are you just trying to save screen real estate? Screen space is often the reason why charts end up becoming too cluttered. What is the best chart type for present, “track of orders or order status”? what is the best way to present data like this?